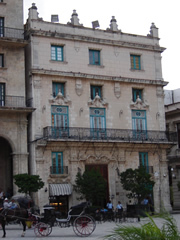 New Hotel in Old Havana: San Felipe and Santiago de Bejucal Hotel. On the corner of the old San Fran Francisco de Asis square, just next to the smart Café Del Oriente restaurant and the Lonja del Comercio building with its Café Mercurio, one of the greatest Havana mansions is being restored to be turned into the San Felipe and Santiago de Bejucal Hotel. The Hotel that shortly will open its doors, owes its name to its former owner, captain Juan Clemente Núñez del Castillo y Molina who inherited from his great-great-grandfather, founder of San Cristóbal de La Habana town, the title of Marquess of San Felipe y Santiago de Bejucal. Among the different architectonical values that make this building one of the most beautiful buildings of the Old Havana there are its magnificent façade, the excellent smithy of its balconies and the elegant cornices of its upper windows. The aforementioned elements have been inspired by those of Plaza de Armas Government House from what it is concluded that the mansion was finished in the last decade of the 18th Century and probably the last one of the greatest baroque Havana mansions. At the 20th Century, this building was one of the branches of the Nova Scotia Bank and later it was used for commercial purposes, civil functions among others. In the year 1944, it was declared National Monument.